We use our Dwarfing too to Cincture the trunk and now we have the results of it staying dwarfed and the flowering and fruiting of this tree is prolific. This is our Kwai Muk tree and because it grows into quite a large tree we cinctured this tree about 6 months ago so we put cuts around the trunk to reduce the flow of sap. The idea being that it keeps the tree smaller because it reduces the vigour and it also encourages flowering and if you have a look at the tree it's just loaded in fruit. 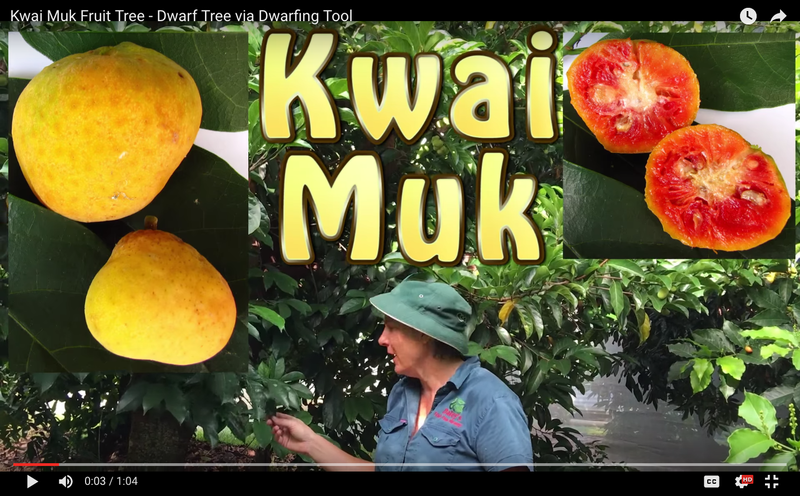 So we have our best crop of Kwai Muks ever and I just love these little velvety surprises they are they've got beautiful sour bright red flesh. I can't wait until they ripen up. It will be another Month I'm guessing. Wow.